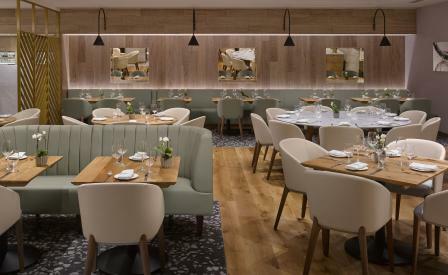 After a decade of service, chef Theo Randall’s restaurant in the InterContinental London Park Lane, has had a makeover. Or a ‘make under’ in this case. For the somewhat staid, more formal interiors have now been swapped for a decidedly more dynamic and casual aesthetic of bare oak tables, modern, gently rounded leather furnishings and a soft colour palette of faded green and dusty pink, accented with anodised brass screens, which function to split the room into intimate zones, while adding visual interest. It was a wise move by London-based agency Superfutures, who opted to create a simple setting to, as they say, serve as an elegant backdrop to the rustic Italian food Randall is best known for. Indeed, the menu has also been refreshed with a series of new dishes to enhance his much loved classics. A smooth barrel-aged Negroni is the perfect preprandial drink to prepare the tastebuds for a series of traditional comfort-food classics of clean ingredients, slow-cooked meats, flavourful pastas and fresh fish. We suggest the creamy burrata, which is perfectly balanced with marinated artichoke, farinata, cicorino, swiss chard and olives, before tucking into sweet lobster linguine cooked to al dente perfection and finished off with the rich pan fried calves liver with sage, salty, crispy pancetta, cavolo nero and lentils. For dessert, a simple, but sharp blood orange sorbet hits the right spot to make way for a tot of fragrant grappa to round things off.